"This is kinda where I came in. 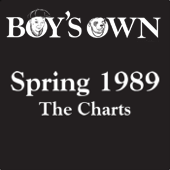 I still hadn`t opened a copy of "Boy`s Own", but I was going to places like the Downham Tavern, Bonnies in Catford, Echoes in Bow, Steve Proctor`s "Promised Land" parties at the Fitness Centre, and the records included in the Boy`s Own charts of the spring of 1989, in retrospect, formed a good part of the music I was hearing. These were the records that I trawled Croydon`s second-hand shops for. In those days I was looking for music that I might have heard on a night out, that other people might of played, rather than what we are supposed to do these days, which is to look for things that nobody else has played or heard. In the days pre-internet, I would go to listen to a particular DJ because only they had a particular record. At the Downham Tavern we would all know Tony Wilson`s sets off by heart. We all knew what was coming next. This didn`t detract from the evening at all. It would, at this point, when only now would you hear a certain tune, actually heighten the excitement. Mass excitement. It would also allow you to time your gear taking to maximum effect. I used to say that by collecting the records I was trying to patch together those half-forgotten evenings of excess, fill in the blackouts, but I think that was only partly true. The obsession is honestly largely driven by a need to know more than the next man, to prove that you have been into this thing since the start (which in nearly all cases is impossible), Balearic to the bone. We all would like to have been there at the start. But we can`t all be Argentinian political refugees about to enjoy our sixtieth summer. The fallout from this bluff / delusion was that sad obsessives like myself pretty quickly ended up with a lot of the more obvious classics, some of which are included here, and as a consequence began to fight / compete / argue with one another for up warm up slots. I can vividly recall catching a Cry Sisco PA as I arrived at a Sunrise rave, just at the point I was about to lose my mind, the break sounding like bombs going off, but when I play it I always see a line of South London girls, top knot Tracey`s, looking cute, smiling and dancing in unison at The Tavern. "Zobi La Mouche" has got to be the quintessential "Balearic" record from `89. I must have heard it everywhere I went and it just about summed up South London`s embrace of European hedonism, along with the slightly dark malevolence at the edges and corners of the dance floor / club that it brought with it. Ryder`s "idiot savant" argot on "Wrote For Luck" pretty much "nailed" how an army of disaffected dodgy geezers were feeling, without having to spell it out. Copies of Dizzi Heights` Style Council-assisted "Would I Find Love" were like gold dust. I survived on a 7" from Beanos for years. Credited as a Weatherall discovery, although Leo definitely played the b-side, "A Gospel", at Amnesia, the story of Andrew`s copy being rushed from one dancefloor to another at Shoom, is one of the legend`s this obsession is built on. The song reminds me of my sister, a "Promised Land" die-hard, and later, of dancing with Bobby Gillespie and a girl in white silk pajamas. I`m sorry Ruth. I still love this record, but like "City Lights", it`s not one I care to play anymore. Again, it carries too much. I did try to "exorcise" it by playing it in Tokyo last month, but it didn`t work. I`d had Harvey`s brother Guy help me banish the ghosts from "City Lights" earlier this year, joining me in singing along, loudly and out of tune, but he couldn`t make it this time. When I saw the chart in the spring 1989 edition of the fanzine, collected in the DJHistory annual, I was both surprised and pleased by how many of the records I already owned. I was also a little disappointed that there wasn`t a page of fresh Pop tat to go looking for. Disco, House, and a crazy New Beat cut-up of Tyrone Brunson`s "The Smurf" (making it sound more like the Human League`s "Being Boiled"). Junior Vasquez getting "spiritual", Blaze getting intense, funky Folk, and The Clash & Mark E. Smith in the dance. Pop stars High On Hope. Canada`s Bassic, Mory Kante cash-ins and Tee Scott & Began Cekic relighting old fires relit. It`s not black, it`s not white, it`s not red, it`s not yellow. I got my Italian bootleg from Oscar in Trax on Greek Street. One love."